Less than six minutes into the 2017-18 NBA season, forward Gordon Hayward dislocated and fractured his left tibia in his Celtics debut. Kyrie Irving tossed an alley-oop to Hayward, with the Celtics leading, 12-9, and 6:45 remaining in the opening frame. Cavaliers star LeBron James came across the paint to contest the pass, and the two briefly got tangled in the air. When Hayward came down, his left foot hit first and contorted underneath him. Officials immediately stopped play and signaled for help. Hayward spun himself around trying to avoid the bodies above battling for the ball. When his ankle came into view of the Cavaliers bench, every player immediately covered his face or looked away. Celtics players huddled in front of their bench at the other end of the floor, and rookie Semi Ojeleye led them in a prayer, according to second-year forward Jaylen Brown. Quickly attended to on the court by training and medical staff, Hayward had his leg wrapped in a black compression cast, and he was loaded onto a stretcher and rolled off the court. Hayward’s dislocated ankle was reset while he was on the court, according to ESPN. During the game, James ducked into the Cleveland locker room, where Hayward was initially evaluated, to check on him. Former Celtic Isaiah Thomas, who is out until January while he rehabs a hip injury, also checked on Hayward in the locker room. Thomas had helped recruit Hayward to Boston in the offseason. Hayward had X-rays done at Quicken Loans Arena, according to ESPN. 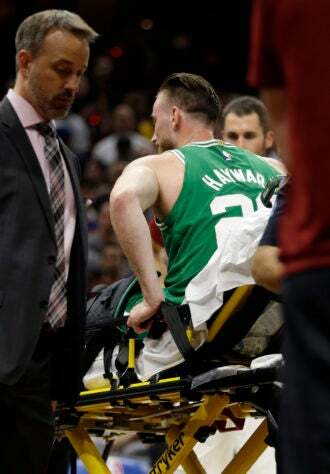 After being examined by both Celtics and Cavaliers doctors, Hayward was taken by ambulance to the airport, accompanied by Celtics assistant general manager Mike Zarren and co-owner Steve Pagliuca. He then was flown back to Boston and transported to New England Baptist Hospital, arriving at about 3 a.m. Wednesday. As of Wednesday afternoon, the Celtics were still awaiting further news on Hayward’s condition and surgery plan. A treatment path would be plotted after Hayward undergoes an MRI and CT on Wednesday, Hayward’s agent, Mark Bartelstein, told ESPN’s Adrian Wojnarowski. Celtics coach Brad Stevens, who canceled his radio appearance on The Sports Hub’s “Zolak & Bertrand’’ show to visit Hayward at the hospital, reportedly will give an update on Hayward’s condition and his timetable for a return late Wednesday afternoon. Yahoo! Sports’s Chris Mannix reported that the injury was described to him as “what looks like a clean break.’’ Mannix tweeted that there was “cautious optimism’’ about the injury. Dr. Fred Cushner, an orthopedic surgeon, told SiriusXM NBA Radio that he also thinks Hayward could make a return this season. And Sports Illustrated’s Tim Layden offered this insight from a retired orthopedic surgeon, who termed Hayward’s injury as a possible SER-4 ankle fracture that is “usually not that hard to fix,’’ depending on the degree of the soft tissue damage.